An ankle sprain results from damage to the ligament structures in that area of the body. Ligaments are short bands of connective tissue that connect two bones or cartilages, thereby forming a joint. Ankle sprains are the most common lower leg injuries in sports, with ankle sprains accounting for over 70% of injuries with some estimating that it accounts for almost 50% of all sport injuries and about 14% of sports-related orthopaedic emergency visits. Incidence rates seem independent of whether the sport is a predominantly upper-body or lower-body activity sport, but research has found that field hockey has the highest rate, followed by volleyball, football, basketball, ice hockey, lacrosse, rugby, track and field and gymnastics. Tibiofibular syndesmosis – where the two bones in the lower leg (called the tibia (shinbone) and fibula (calf bone)) are connected to each other at the point where they meet the ankle. Talocrural joint – where the two bones in the lower leg (fibula and tibia) are connected to the ankle bone. Subtalar joint – where the ankle bone is connected to the heel bone. The ankle is stabilized by passive and active elements; the ligaments act as passive stabilizers and constrains movement of the ankle joints while muscles act as active stabilizers, which work in a concerted fashion to bring about ankle and foot movements such as pointing toes, flexing toes, and rolling the ankle in and out. Most ankle sprains occur from damage to ligaments located on the outer part of the ankle due to internal rotation of the ankle, and this type of injury is commonly called lateral (which is the medical term for outer side) ankle sprains. In this region of the ankle, three ligaments are usually considered when discussing ankle sprain: the anterior talofibular ligament (ATFL), the calcaneofibular ligament (CFL) and the posterior talofibular ligament (PTFL). 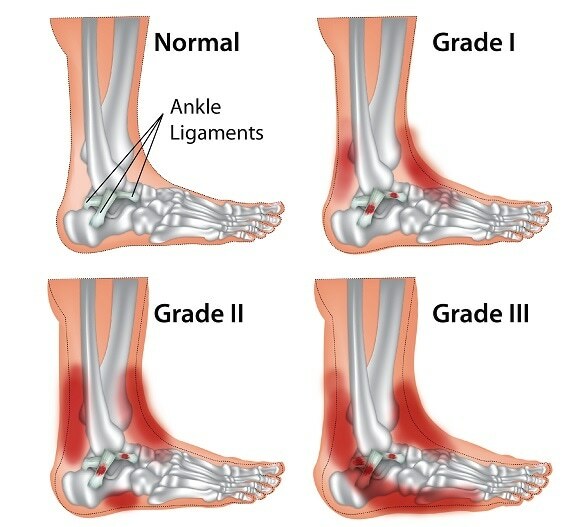 In terms of ankle sprains, the ATFL ligament, which connects the fibula to the ankle bone, is the most important to consider as it is the weakest and most commonly injured ligament in a lateral ankle sprain, with approximately 70% of all sprains involving isolated ATFL injuries. About 20-25% of lateral ankle sprains also involve injury to the CFL ligament, which connects the fibula to the heel bone, in addition to the ATFL ligament damage. Injury rarely occurs in the PTFL ligament, which connects the fibula to the ankle bone, thanks to its position and strength. The other categories for ankle sprains are high ankle sprains and medial (which is the medical term for inner side) ankle sprains. High ankle sprains usually result from damage to the tibiofibular syndesmosis due to external rotation of the ankle while feet are flexed, while medial ankle sprains are from damage to the deltoid ligaments located on the inside of the ankle by the same external rotation/flexed feet action. Both are far less common than lateral ankle sprains. In the case of high ankle sprains, only 3% have an isolated tibiofibular syndesmosis injury. The most common scenario that leads to a sprained ankle involves the ankle being rotated inwards, with the foot pointed downwards. Both positions add strain to the ATFL ligament, which is responsible for restraining the ankle when pointing down or rolling the ankle inwards, hence why it is the most susceptible to damage in lateral ankle sprains. The extent of the injury is determined not only by how it happens but also how much force is applied to the ankle during the event. The ATFL might tear, which is followed by a rupture in soft tissue support. With the inversion of the ankle, the CFL will get injured, followed by the PTFL, to varying degrees, and damage to other ligaments. Patients usually hearing a snap around the ankle region when the injury occurs. Pain and swelling can at the site of injury. Most patients experience pain when trying to put weight on the injured ankle. For high ankle sprains, pain and swelling may also be present in the inner back region of the ankle. For the medial ankle sprain, the lateral side of the ankle may also be swollen. Discoloration due to bruising, 24 to 48 hours after the injury. In a suspected case of an ankle sprain, the possibilities of other injuries or that the symptoms present are actually due to a different type of injury, such as fractures, have to be eliminated. Localized pain and swelling at the onset of the injury becomes more generalized after several hours have passed, which makes diagnosis more difficult and less reliable. In diagnosing an ankle sprain, the patient’s history including past injuries and cause of the present injury is carefully evaluated. Patients with stress fractures in the ankle may have similar symptoms, for example, but different history. Several bones in this region are also prone to stress fractures. The anterior drawing test assesses the integrity of the ATFL ligament and involves the examiner holding the heel of the seated patient firmly with one hand and holding the tibia with the other hand. To improve sensitivity, the ankle can be placed slightly downwards, about 10o. If the ankle bone moves forward to a greater degree than normal with respect to the tibia, this is a positive sign of a lateral ankle sprain and a tear in the ATFL, especially if the movement is greater than what is observed in the unaffected ankle. The talar tilt test assesses the integrity of the CFL ligament and involves the examiner holding the heel and anklebone stable, whilst moving the heelbone inwards with respect to the tibia. It’s important that both the heel bone and anklebone are held as a unit, to limit movement during the examination. Again, observations in the affected ankle ideally are compared with the unaffected ankle. The eversion test is done to diagnose a medial ankle sprain. In this test, the heel is held in one hand while the tibia is held in the other. The heel is then twisted in and out. With the knee and ankle perpendicular to each other, the midfoot area is twisted outwards. Pain is a positive result and could be due to a medial or high ankle sprain. The squeeze test is performed by compressing the midshaft of the fibula and the tibia together, with pain indicating tibiofibular syndesmosis injury found in a high ankle sprain. These physical tests should be interpreted with caution but can help to make a diagnosis when evaluated alongside with historical information. Ankle sprains are usually classified based on severity, using a 3-grade system. Grade I is mild, where the ATFL ligament has no big tears, there is little swelling or tenderness, little loss in function and no mechanical instability at the joint. Grade II is given for injuries that involve partial macroscopic tears to the ATFL ligament, moderate pain, swelling and tenderness, some loss of function and some mechanical instability. Grade III is given when there is a complete rupture of the ATFL ligament, with severe swelling and tenderness, haemorrhage, limited function and joint instability. Treatment should be designed based on severity. In most cases, surgery is not necessary with a well-designed management plan. If possible, long-term immobilization should be avoided. In the short term, however, immobilization has been found to be beneficial. Even in those with grade III severity, early weight bearing and movement with the appropriate support have been found to improve recovery. The use of braces has also been found to decrease symptoms and improve function. Manual therapy such as soft tissue massages also decreases stiffness and increases the range of motion. Therapeutic exercises that focus on increasing the range of motion and strengthening surrounding muscles, along with conventional treatment using ice, compression, and elevation have had significant positive effects on recovery. If non-surgical treatment does not lead resolve injury, surgery may be explored. Renstrom, P. A., and Konradsen, L. (1997) Ankle ligament injuries, Br J Sports Med 31, 11-20. McGovern, R. P., and Martin, R. L. (2016) Managing ankle ligament sprains and tears: current opinion, Open Access J Sports Med 7, 33-42. Kaminski, T. W., Hertel, J., Amendola, N., Docherty, C. L., Dolan, M. G., Hopkins, J. T., Nussbaum, E., Poppy, W., Richie, D., and National Athletic Trainers, A. (2013) National Athletic Trainers’ Association position statement: conservative management and prevention of ankle sprains in athletes, J Athl Train 48, 528-545. Wolfe, M. W., Uhl, T. L., Mattacola, C. G., and McCluskey, L. C. (2001) Management of Ankle Sprains, American Family Physician 63, 93-105. Lynch, S. A. (2002) Assessment of the Injured Ankle in the Athlete, J Athl Train 37, 406-412. Fong, D. T., Chan, Y. Y., Mok, K. M., Yung, P., and Chan, K. M. (2009) Understanding acute ankle ligamentous sprain injury in sports, Sports Med Arthrosc Rehabil Ther Technol 1, 14. Teitz, C. C., and Harrington, R. M. (1998) A biochemical analysis of the squeeze test for sprains of the syndesmotic ligaments of the ankle, Foot Ankle Int 19, 489-492.